What were the must-have fashion items in Korea more than a century ago? In the early 1900s, stylish people keen on fashion trends were dubbed “modern girls” and “modern boys,” with Western culture making inroads into Confucian society at the time. Women began to wear Western-style dresses instead of “hanbok,” or Korean traditional costume, and they would hold a parasol in one hand to cover their faces, effectively replacing the skirt-shaped headgear used to conceal their faces in the deeply Confucian Joseon era. They also wore an opera bag around the wrist to carry small makeup essentials. Modern boys in Seoul wore fedoras, carried a cane and walked with great confidence on then newly paved asphalt roads in the capital city. From early trends to present day, 100 years of Korean fashion can be seen at the exhibition “Mode & Moments: 100 Years of Korean Fashion” being held at Culture Station Seoul 284 from Sept. 1-22. It features some 60 major Korean fashion designers, with their creations exhibited chronologically, spanning from the 1910s to the present. It also marks Vogue Korea’s 20th anniversary this year. 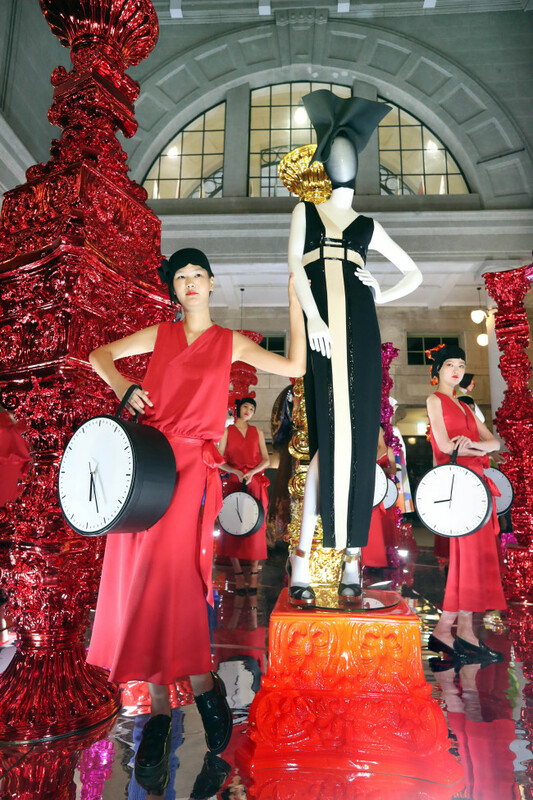 At Wednesday’s preopening, models in light sleeveless, free-flowing red dresses -- and holding clock-inspired round bags -- showcased a total of 13 pieces of clothes selected to represent major features of Korean beauty. The “masterpieces” of Korean fashion, as Suh Young-hee, fashion director of the exhibition and renowned stylist called them, are displayed alongside colorful installations of Greek pillars created by contemporary artist Choi Jung-hwa. “This exhibition is also a collaborative work between fashion designers and contemporary artists,” said Lee. Two separate rooms of the exhibition are dedicated to two leading figures of Korean fashion: Choi Kyung-ja (1911-2011) and Norah Noh. Choi studied fashion in Japan and opened one of Korea’s first Western-style tailor shops and the first fashion institute in the North Korean city of Hamheung in the 1930s. She moved to Seoul during the Korean War in the 1950s and in 1961 opened another fashion institute where some second-generation fashion designers such as Andre Kim, Lee Shin-woo and Lee Sang-bong studied fashion. 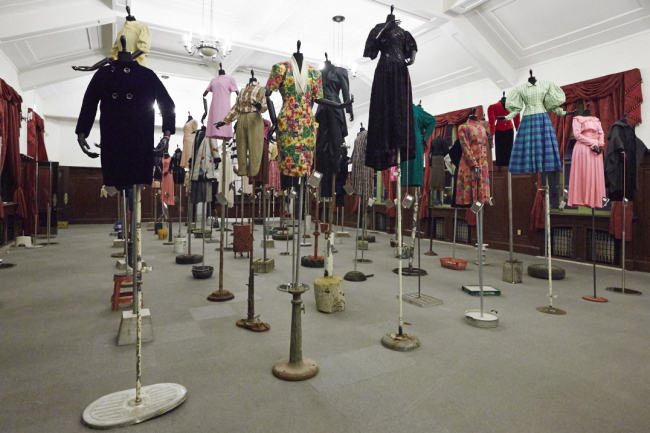 Another room shows creations by Nora Noh, 88, another first-generation Korean fashion designer, including her minidresses and ensembles. Noh’s clothes were known to best reflect the latest in Western fashion trends and were sought after by actresses and trend-savvy women from the 1950s to the 1970s. Korea’s ’80s fashion offers an interesting glimpse into the vibrant modern Korean society marked by the 1988 Seoul Olympic Games and the fast pace of urbanization. Minidresses with large shoulder pads are on display under glittering balls, offering a glimpse of the power dressing enjoyed by singers such as Insooni known for her powerful vocals. Contemporary Korean fashion is marked by wearable, yet freestyle fashion reflected in the creations by some globally well-known Korean brands such as Juun. J, Steve J and Yoni P.
Admission to the exhibition is 10,000 won ($8.90). For more information, visit www.vogue.co.kr/vogue20.